Cedar is light, soft, scented and highly decorative with contrasting early wood and late wood bands. Cedar is naturally durable but has considerably lower strength properties than radiata pine so is not a structural timber. A similar product to redwood. Cryptomeria heartwood is a warm reddish brown colour with some dark streaking. The sapwood is almost white. Thuja heartwood is generally a pinkish salmon to red colour but can also be chocolate brown. The sapwood is narrow and almost white. Deodar heartwood is a yellow brown. The sapwood is pale yellow. Cedar is dimensionally very stable in service. Texture is fine but uneven due to the prominent growth rings. Grain is straight. 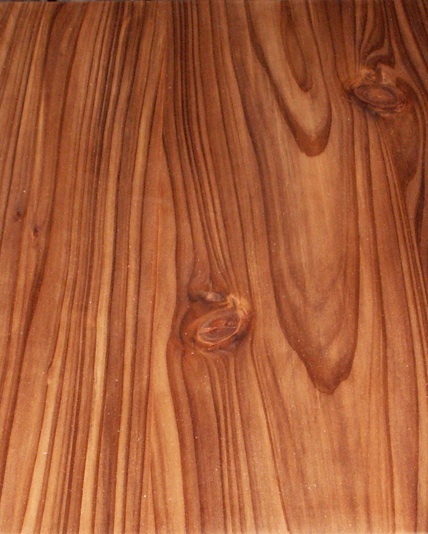 Cedar, with its attractive appearance, is suitable for panelling and joinery. However, because the timber is soft it is subject to indentation and therefore should not be put in applications requiring a hard-wearing timber. Cedar is ideal for exterior cladding, provided only heartwood is used. Cedar is a low density softwood. It is not a structural timber, being considerably weaker than pine. Thuja is lower density than Cryptomeria. Density of Cryptomeria does not vary much. Cedar takes nails and screws well. However, nails can track around the harder latewood bands, especially brads used on finishing timber. Galvanised fixings are recommended for exterior uses because unprotected iron nails stain the timber. Alternatives include stainless steel, silicon bronze or copper. Nail holding is poor to medium and annular grooved nails or special fasteners may be required to ensure a stong assembly. Not suitable for applications subject to loads or surface abrasion (wear), because of its low density and softness. Subject to surface erosion from exposure to weather. Cedar is easily worked. Since cedar is very soft there is a risk when dressing it that the cutters may compress the softer earlywood which will later recover to produce a ridged surface. Thus sharp cutters are required. Sanding dust can be very irritant to the breathing passages so a well-ventilated workshop is essential. Cedar takes glue, stain and paint well. Cryptomeria may exude resin so care is needed with gluelines. A yellowish colouring may leach from the wood when exposed to the weather. This may stain white painted surfaces below it. Thuja is prone to checking and collapse in the early stages of drying. Flatsawn Thuja may have issues with latewood lifting off earlywood, which can peel off in front of it. Cedar heartwood is not ground durable. It is durable in above-ground exposure conditions and is suitable for exterior applications such as cladding. Sapwood is perishable but is fine for indoor use.